These birds are pretty common here in this part of Florida, wherever you find fresh water. We spotted this one at Rainbow Springs State Park. I'm not sure it's happy to share the log or do you think that turtle took a 'snap' at his leg? heehee! 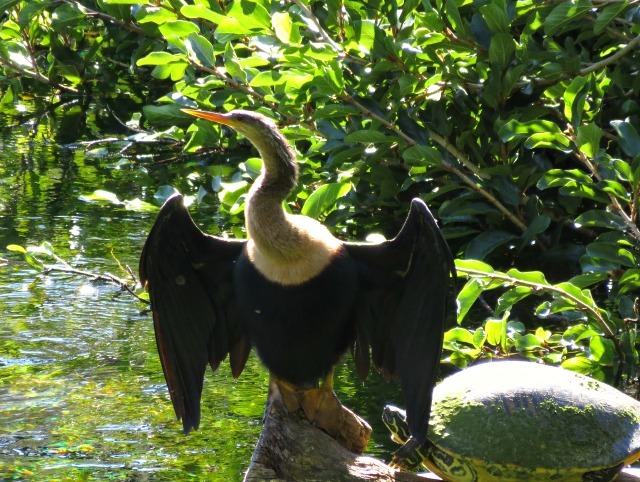 Because the Anhinga does not have waterproof feathers, it must spread it's wings to dry the feathers before flight. 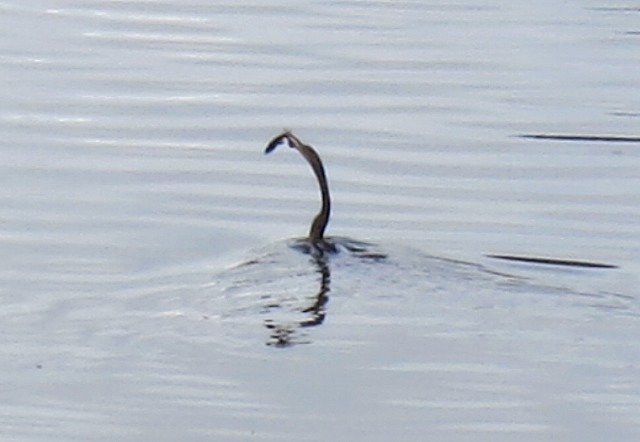 It is able to stay below the surface of the water for longer periods of time and is know as the 'snake bird'. 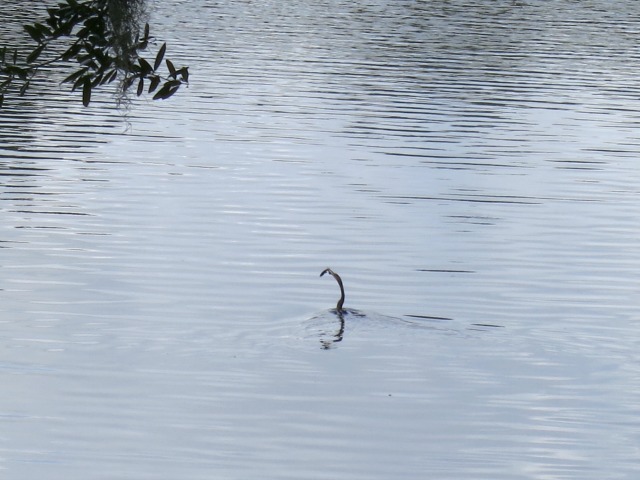 The long slender neck is the only thing above the surface so it looks like a snake ready to strike. The Anhinga is in the darter family and uses it's sharp slender beak to spear fish. I was lucky enough to get this photo when he had just speared a fish. Good morning, awesome photos and post on the Anhinga. I like the turtles too. 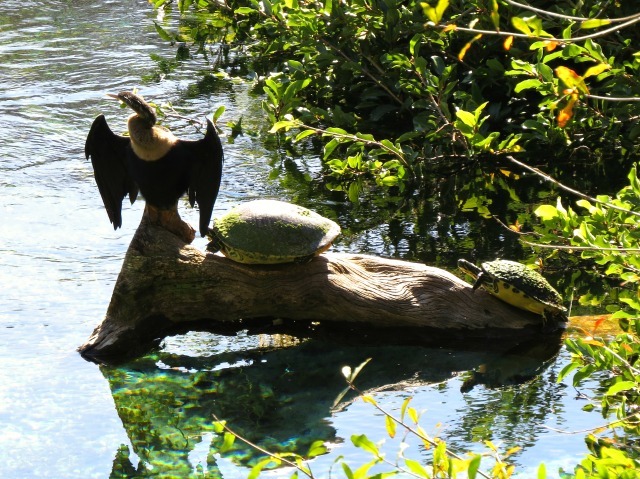 At least they are not the snapping turtles or the Anhinga could loose a leg. Thank you for linking up and sharing your post. Happy weekend and happy Easter to you and your family. Wishing you a beautiful and Happy Easter! Great pic, I don't have them in Kentucky so I am really enjoying your photos. Amazing birds. Not very attractive, but interesting, none the less. We have few water birds here, so I enjoy seeing your photos. Happy Easter. Intriguing post with a fascinating bird ~ wonderful photos! 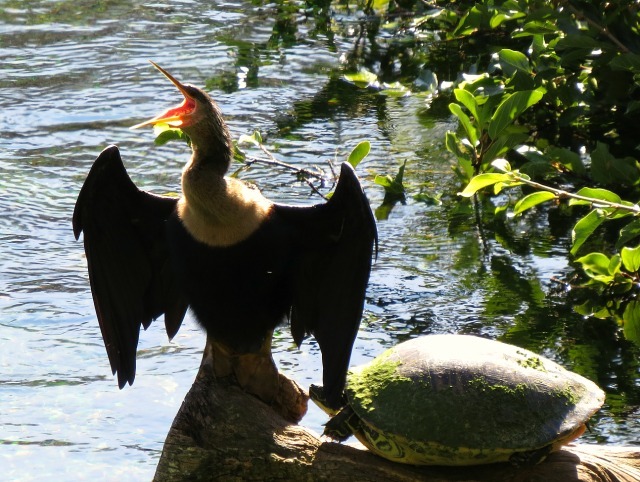 The Anhinga (new to me) sounds similar to our Cormorants who also have to dry their wings and can stay underwater longer and go deeper than other diving birds. But I think your Anhinga has a much longer neck. Very interesting! Wow-- nothing like that around here. Interesting! Happy Easter! very nice captures, seems you got very close to the anhinga. i don't think i have ever seen one before!!!! that is an unusual bird to me. Not close to any water in my neck of the woods so enjoy learning about other critters. If I saw that in the water I would indeed think it was a snake. Happy Easter Diane to you and yours. Interesting bird and big turtle! Fabulous photos. Such an interesting bird. I love that you captured the turtle. Happy Easter, so thankful for all our blessings. Diane, such a strange bird. It almost looks like two or three different birds pieced together. Have a blessed Easter! Love and hugs! So nice to see the turtles there too! I like watching them dry their wings. Great photos. What luck to catch it with a fish. They seem to be a lot like our cormorants - not waterproof so they are often seen drying their wings out. What a silly thing for a water bird - to not be waterproof - go figure. Happy week ahead - I'm slowly catching up on my blog reading. What terrific images. I like 'em all Diane. Exceptional. Thanks for adding your link for us birders at I'd Rather B Birdin' this week. It's always appreciated. Hello Diane! :) I'm so late at visiting everyone. Hope you had a nice Easter. Love these shots of the Anhinga, a new bird for me to see and learn about. The snake name seems appropriate as it's seen in your shots swimming with it's catch, it does look like a snake. I learn something from you every time I visit. How fascinating is that bird? And it does look like a snake in the water! Amazing photos! TYFS. You have exotic birds there in Florida. Great pictures, Diane. Wednesday Wee Ones "Happy Spring"
*Bubbles* for Wednesday Wee Ones! The Lanai, My favorite room of the house! A Four Leaf Clover for Good Fences?